The Internet is a wonderful time machine. Just a few search words and clicks away, there’s Miles Havlick, arms raised, crossing the line first in the 20-kilometer freestyle mass start at the 2013 NCAA Skiing Championships. It was the second consecutive NCAA championship for the now 28-year-old Havlick — he won the 2012 NCAA title in the 20 k classic. As a standout skier at the University of Utah, Havlick made the jump to Sun Valley Ski Education’s Gold Team. He skied with the team from 2013-2016. Eventually, Havlick expanded on his undergraduate degree in exercise physiology and earned a master’s degree in the same field from the Norwegian University of Science and Technology in exercise physiology. Havlick completed his graduate work in 2018. 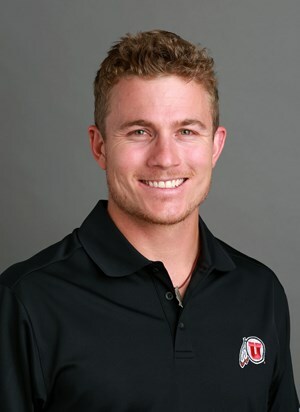 He was based out of Trondheim, Norway at an academic institution renowned for its high quality cross-country specific research, and soon landed a job as the new University of Utah Head Cross Country head coach. Utah comes off a season where it replaced several coaches in its ski racing program, including its Director of Skiing. Fredrik Landstedt was announced as the new director in July, 2018. Below is our recent interview with Havlick. The coach responded to FasterSkier’s questions in writing. 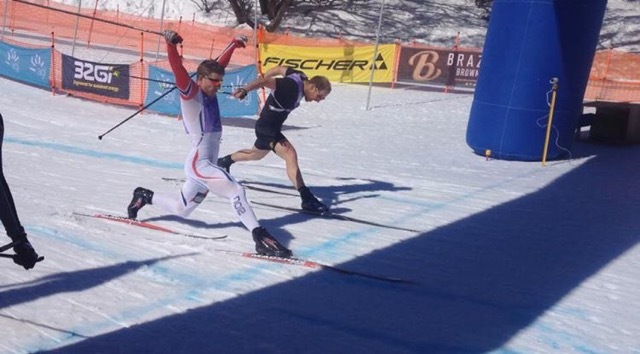 Miles Havlick (l) outlunges Australian National Team member, Phillip Bellingham for the win in the men’s 42-kilometer 2017 Kangaroo Hoppet at Falls Creek Resort. FasterSkier: You went unrecruited from Boulder High School in Boulder, Colo., and you were a walk-on at Utah. Big picture, what experience best informs your coaching? Miles Havlick: My experiences as a racer certainly dictate my coaching decisions more than anything else. The lessons I have learned as a result of the highs and lows I have experienced as a competitor are my most valuable assets to advising my athletes in a more effective way. FS: What was it like for you as an unrecruited athlete out of high school and what were your skiing opportunities? MH: After high school, I decided to take a post grad year to ski with the Sun Valley Ski Education Foundation in Ketchum, Idaho. I found this year incredibly valuable in preparation for college life and easing the transition into the fast pace of RMISA skiing. This post grad year enabled me to train regularly with some of the top skiers in the country and learn from their professionalism, drive and dedication. It also provided an opportunity to learn how to take care of myself (cook, clean, get to bed early, etc.) without the additional stress of college classes. Those benefits along with the fact that I entered college a year older, stronger, and more mature (hopefully) really paid off! From there, I moved to Salt Lake City and began the most memorable years of my skiing career at the University of Utah. FS: Utah can be a rather tough place to break through as they recruit heavily from Europe. How does your experience at Utah shape how you will recruit, assess, and develop athletes? MH: Utah has typically maintained a relatively small team with roughly 6 men and 6 women on the Nordic side, allowing each athlete to optimize the resources available at the U. This also makes each member, whether joining the team as an American or from overseas, vitally important to the cumulative success of the team throughout the year. Foreign skiers in general tend to be very mature in terms of their knowledge of training philosophy and understanding their needs as an athlete. This is a result of skiing at a high level (often with a National or Development team) but also generally being a few years older than incoming American freshmen. I certainly benefited a lot from the wisdom and professionalism of my European teammates and hopefully I pushed them in daily training too – no Norwegian wants to let an 18-year-old American beat them in a rollerski speed! I continue to believe that the collaboration between American and foreign athletes in collegiate skiing is mutually beneficial and valuable for the development of cross-country skiing in the US. FS: You clearly were a top college skier while at Utah. What do you attribute your growth to as an athlete while attending Utah? We’re guessing you had many skiers to push your limits while training. MH: My most successful races in college were truly a reflection of the team. Our coaches really fostered a positive team atmosphere, which snowballed into a very productive environment at training, competitions and life at home. A goal I set early on was to learn something from each of my team members. Whether it was imitating their weight shift while skate rollerskiing up Emigration Canyon, showing up to practice with a contagiously positive energy, gritting the teeth for one more hard interval up Dry Creek, or just taking a spoonful of fish oil when feeling on the verge of sickness; there was always something to be learned from everyone. FS: We like this quote attributed to your dad. We found it in an old Daily Camera piece. Here’s the quote: “For me, sports teaches you how to set goals and to deal with disappointment, and every once in awhile you get to drink from this intoxicating cup of success,” said his dad, Scott. How have the sentiments articulated by your dad manifested for you as it relates to your ski career and how you might impart some wisdom on a younger generation of skiers? MH: As a former coach of mine always said, “we are only elite ski racers for a very short period of time in our lives, so we need to make the most of every single day”. In other words, we need to set goals, both long term and short term and get better in one way or another every single day and from every single training session. From the beginning of June, we really only have 160 days until the snow flies again. That is not a whole lot of time to make meaningful changes, so being diligent and purposeful during each training session is critical to improvement. If we are doing this, despite disappointing results, we can be confident that we are heading in the right direction and making progress towards our goals. Success along the way provides an important boost in motivation and reassurance that we are on the right path, but in the end what counts is knowing that you did your very best and enjoying the process, not just the end result. FS: What were the precise years you skied professionally. You won the Kangaroo Loppet in 2017, but you might have been a grad student by then. MH: I raced with the Sun Valley Gold Team from 2013 to 2016 before deciding to pursue a Master’s degree. Luckily, I got a lot of time on snow while coaching leading up to the Kangaroo Hoppet, just enough to counteract the time spent sitting at school desk over the previous year! FS: Can you provide us a run down of your coaching experience. We know you coached in Norway and in Australia, as well as served as a travel coach with the Australian National and National Junior Team. MH: Throughout my years with the Gold Team, we ran group clinics for Master skiers in addition to some one-on-one coaching on the side. I helped out as a volunteer coach for the University of Utah for several fall semesters before I the SuperTour season kicked off. Between my years in Norway, I worked as a coach with the Birkebeiner Ski Club in Mount Beauty, Victoria for Australia’s winter season culminating with the 2017 Kangaroo Hoppet. This opportunity also lead into working as an assistant coach and wax tech for the Australian Junior National Team at several events around Europe including the World Junior Ski Championships in Goms, Switzerland. I was also fortunate enough to support the Australian contingent of the Swix China City Sprint Tour in Yan’an, China last March. FS: You have an exercise physiology degree from Utah (2013) and master’s degree from Norwegian University of Science and Technology in exercise physiology in 2018. Why did you choose to study in Norway? MH: Norway is the epicenter of cross-country skiing, they offer great study opportunities and I wanted to experience something new. FS: What was the focus of your graduate thesis and what did you learn? FS: What can you tell us about the investment in Norway as it relates to applied academic research and cross-country skiing? MH: Norway is the best cross-country skiing nation in the world for a reason. The entire country is made up of enthusiastic sports fans with PhD students devoted to improving cross-country ski technique, equipment development and optimizing training. FS: How will your experience in Norway inform your ski coaching? MH: My time in both Norway and Australia opened my eyes to two unique skiing cultures and allowed me to reflect on the unique challenges and opportunities that we face here in the US. This insight complements my experiences as a racer and I believe will prove quite valuable in developing skiers at Utah. In the big picture, it has not been all that long since I was skiing at the U, but everything I have done since then has improved my ability to make more informed decisions about skiing and training. If I knew everything I know now when I was a freshman at Utah, I believe I could have been a much better athlete. This knowledge is what I hope to instill upon the athletes that I am lucky enough to work with. FS: Can we expect Utah to have a pipeline of skiers from Trondheim? MH: I wouldn’t say that, but Trondheim certainly has a rich culture of skiing and obviously all the ingredients to produce a large population of great skiers. I would certainly be excited to expose another Trønder or two to the resources and training environment that surrounds the University of Utah. FS: What do you see as your biggest challenges at Utah? MH: There is obviously a mountain of things I need to learn being a new coach of NCAA skiing, exemplified by the delay in getting this interview back to you. The greatest challenge for me is balancing coaching with all of the administrative components while also implementing all of the ideas that I have to take the program to the next level. I am very excited to be part of this talented Utah coaching staff, work with amazing collegiate athletes and helping to carry on the long-standing traditions of skiing excellence at Utah. FS: You come into a storied program that has gone through some major changes – the Head Nordic coach and head of skiing at Utah have been replaced within the last 12 months. What is the atmosphere like right now at Utah? MH: The team has been energetic and looking great this fall. Everyone is strong, healthy and really psyched to get the race season underway. I’m excited to see what we can do!